The next edition of the Carnival of Irish Heritage and Culture will be a St. Patrick's Day "virtual parade" online. Anyone who would like to particiate is welcome, whether or not they have Irish roots. For more information on how to participate or to check out the latest carnival head over to http://www.irishheritagecarnival.blogspot.com. I also posted about the new American version of the television show Who Do You Think You Are? Set your recorders to Monday nights at 8PM on NBC starting April 20. What's new at Lisa's Family History: Genealogy Made Easy podcast. Episode 12: I you a comprehensive overview of online family trees. And then we go straight to the source with an in depth interview with Kenny Freestone, Senior Product Manager at Ancestry.com whose primary responsibility is their online family tree tool. Episode 13: We continue exploring our tree options with Scott Huskey of Photoloom.com. 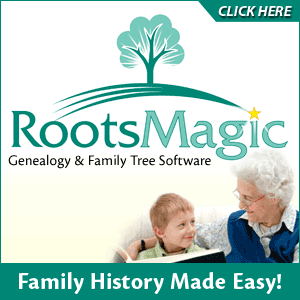 They offer an incredible online visual approach to trees and research that centers around your own personal family photos. Then I talk to Sasha Masick of GeneTree, who spices up their family tree tool with a DNA testing component. Episode 14: You've got to tune in to hear how to go from one name and birth year, to three generations of family in 1 hour or less. It's absolutely possible, and I'll show you how in this episode. Then as we finish up with online family trees, I thought it was important to go over the techniques for following up on all those great connections you can make by posting your family tree online. We'll get started in Episode 14 talking about how to locate telephone numbers online, the prep work you need to do before you start to dial, breaking the ice and conducting the interview. Then we'll finish up in Episode 15 on Feb 6 with what we as the interviewer should be doing during the call, what to do if No Answers, we'll cover the "Must Ask" Questions, and how to wrap up the call. The folks over at the 1911census.co.uk officially launched their website this month. And they have added many of the counties that were unavailable during beta testing including Lancashire, Essex, Kent, Yorkshire (West Riding), Nottinghamshire and Herefordshire so you can now access those British census records from 1911. Lisa answers an email from Rollei in Australia about photo preservation and Maria asks for advice on how to inquire about delicate subjects with an elderly relative. The gem was called Christmas in July and I showed you how to make cover a store bought candy bar with a home made Christmas Label that would evoke genealogical memories. The candy bar made a great stocking stuffer. Well, I'm up for chocolate any time of year, and Valentines day is a perfect time I think to take a new twist on that idea. This time we have a new theme to inspire us - the theme of Valentines Day and love. I'm guessing thereâs a romantic couple or two in your family tree. Perhaps your bar could pay tribute to one of them or to a few couples. You could give these candy bars celebrating the love of the past to your family of today. Your kids and their spouses, grandkids, you get the idea. Think how surprised and thrilled an elderly aunt or uncle would be to be remembered on Valentines day with a small package in the mail containing a family history candy bar. If your feeling a little more grand than a simple candy bar, consider buying a heart shaped box of candy, tracing the lid, and creating a label that could cover the entire label with a custom message of ancestral love. Use heavy weight or photo paper and attach it with a light coat of rubber cement or use double sided tape. If the box is just a bit bigger than a piece of printer paper you could put the digital file you create on your computer of the label onto a flash drive and take it into your local copy store to print out in the correct size. Here again is your chance to share some of your family's heritage with your family today. Kindle their interest in the familyâs history while showing them that you care with a sweet memories candy bar or valentine box. If you do create some sweet memory candy bars this Valentine's day be sure and snap a photo and email it to me. I really enjoy seeing what you guys come up with!